Launching on itv in mid 2012, Tipping Point competition is an ITV gameshow based on the popular “coin pusher” arcade game that many of us played as youngsters and continue to play once a year with 2p coins (10p if you’re feeling flush!) at arcades during UK seaside holidays! Hosted by Ben Shephard and aired on daytime television in the afternoon, the Tipping Point show got mixed reviews. For viewers, the Tipping Point competition is a chance to win some easy cash. We post the latest Tipping Point competitions here so you can find them easily & enter online, via sms, phone or post. For viewers, the Tipping Point competition is another opportunity to win big money through weekly and bi-weekly cash prizes of £10,000 and £20,000. The Tipping Point is seasonal so the comp above may be out of date. Below are a few other TV competitions we’ve recently added to the site. Similar to other itv competitions, the competition is announced during the show and is usually a large cash prize on offer. 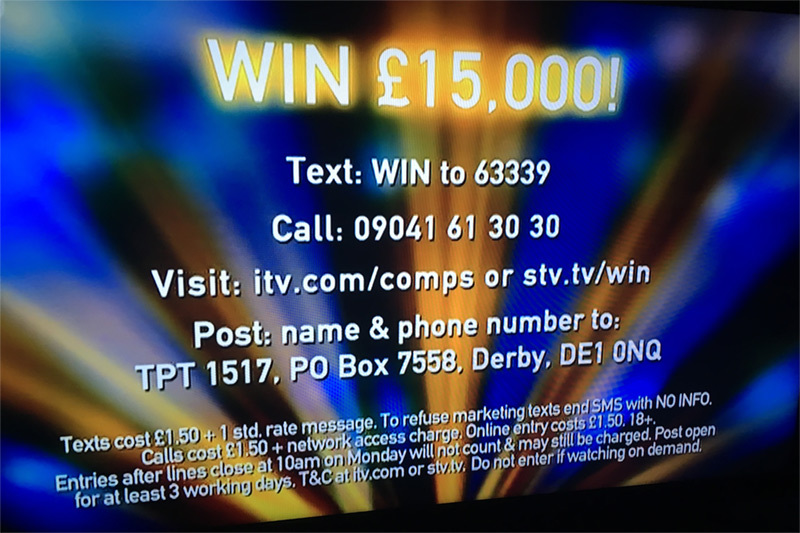 Viewers can then enter the competition via telephone call, sms text message, online via the itv.com/win website or by using a postcard. Entering via post is the only “free” method as phone calls and text messages are premium rate, costing £1.50 + network fee per entry at the time of writing. Cash prizes so far have been offered weekly but announced daily, with multiple entries being allowed per phone number. At tv competition we publish the question and answer (if there is one), alongside information as to how you can enter, the deadlines and entry methods. Rather than 2p or 10p, the coins are worth £50 each. In the original game each player is given three coins and in a “fastest finger first” manner, press their buzzer to answer a question. If they answer the question correctly, the contestent can choose to play themselves (put one of their coins into the coin pusher) or they can choose another player to play instead. Their decision is based on whether they think the machine will play out or not; if it is at the Tipping Point – it’s a gamble. However if they press the buzzer and answer the question incorrectly one of their coins is placed in a penalty pot (which is up for grabs at the end of the round). There is then a round of rapid fire questions for each individual contestant, each correct answer wins them a coin…they then use these coins to try and win more coins by pushing the machine to the tipping point! There is then an “back and forward” session between the final two players, whereby coins can be won or lost – the winner progresses to the jackpot final. A large “Jackpot” counter is dropped into the machine. If the player gets it out (by entering coins into the coin machine and pushing it to the tipping point) the competition is over and they win £10,000. 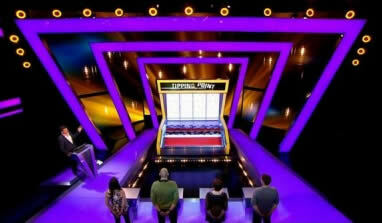 The contestant gets to answer 6 questions and choose a difficulty level of 1,2 or 3. If they answer a level 1 correctly they will earn 1 coin, level 2 gets them 2 coins and level 3 gets them 3 coins with which they can play (an incorrect answer gets zero coins). Each regular coin that comes out of the machine is worth £50 and (assuming the jackpot coin has not came out) the winner is give the opportunity to walk away with the coin value as a cash prize or to gamble for the full £10,000. The gamble gives them three more coins…but if they fail to reach the tipping point they loose they walk away with nothing. Success in the first series was pretty high; of 20 episodes only one person walked away with nothing whilst 5 (25%) managed to walk away with £10,000 by winning the Tipping Point competition jackpot. If you’d like to be on the show, do a quick Google search as Tipping Point is often looking for contestants.